Fill Flash in Digital Photography is quite old method still used to brighten the darkened area when a subject or human face is standing with sun at ~ 90 degree. In most cases we do not use the built in Flash as the direct light, which is usually more bright than the other light resources from the surroundings as if burn the parts of the photograph. But in these cases, as the sun is more brighter at noon and cast quite harsh shadow, using Fill Flash removes them effectively. As the terminology Digital Photography encompasses a wide range of photography device, starting from a basic mobile camera to high end DSLR camera, it actually becomes difficult to direct the user how to use the good effect of Fill Flash – the Flash units differs in size and location from the lens and might not be able to remove the shadows accurately, in fact in some cases, it might add other artifacts of Digital Photography. Most Mobile camera, point and shoot camera, DSLRs include a fill flash mode or always flash on mode, that forces the flash to fire in any situation. Basically this has to be used for getting the good effect from Fill Flash Method. Fill Flash method can be used with flash synchronization. The exposure is determined by the given ambient light, flash is generally used only as a brightener and illuminates the main subject, which are in strong light-dark contrast zone and there is a better shadow detail in the recording. Fill flash is useful for a strong direct light such as strong sunlight, it prevents the foreground to go too dark. In gray and misty weather, it lights the foreground to the necessary to ensure that the colors appear clearer and purer. But it can also be used to freeze a motion occurring at slow shutter speeds to remove strong blurring of moving subjects. 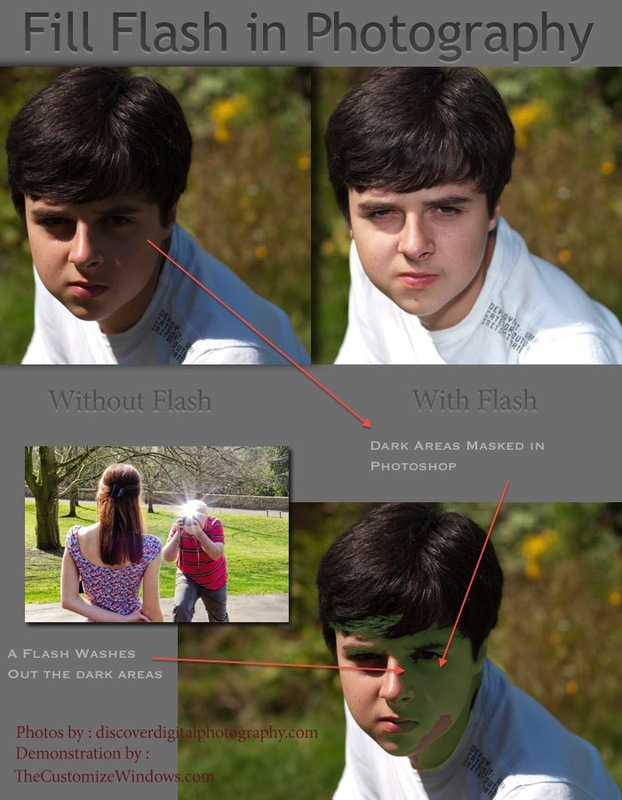 The flash is often used with reduced power and brightness to the ambient light comes into its own. Some flash units have a special unit for this task, which diverts some of the light of the flash. Modern automatic cameras, it generally automatically determined whether there is the need of brightening with flash, still manual override is often needed. In manual control the balance between day and flash is desirable. Initial experiments should start with a flash intensity of -1 EV. This Article Has Been Shared 7292 Times! Cite this article as: Abhishek Ghosh, "Fill Flash in Digital Photography," in The Customize Windows, January 18, 2013, April 25, 2019, https://thecustomizewindows.com/2013/01/fill-flash-in-digital-photography/.